Before These Crowded Streets (1998), Listener Supported (1999), Weekend On The Rocks (2005), Live In New York City (2010), Live Trax Vol. 2: San Francisco, CA September 12, 2004 (2004), Live Trax Vol. 3: Hartford, CT August 27, 2000 (this album) (2005), Live Trax Vol. 8: East Troy, WI August 7, 2004 (2007), Live Trax Vol. 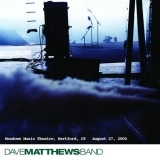 11: Saratoga Springs, NY August 29, 2000 (2008), Live Trax Vol. 19: Rio De Janeiro, Brazil September 30, 2008 (2010), Live Trax Vol. 22: Scranton, PA July 14, 2010 (2012). Sorry, no matches on eBay for "The Stone Dave Matthews Band".